Palermo's Judaic heritage is a hidden legacy carved in stone. See it with an exclusive tour of Jewish Palermo. What You'll Find Here: Places open to the public, especially sights of historical or archaeological interest, and nature reserves. Attractions described on other pages are linked. The Travel FAQs page explains seasons, open hours and where to find visitor information, and the travel planning page is also helpful, while the sightseeing page suggests various ways to visit Sicily's fascinating sights. Our online Magazine presents articles on places, too. What You Won't Find Here: Less important sights. Ficuzza is listed because of its easy access, while caverns (usually closed) are omitted because of their inaccessibility. Some larger public beaches are mentioned, but private ones are not. Nor have we included country house resorts, thermal springs or camp grounds, which are described on our FAQs page, or minor archaeological sites which are rarely open to visitors. If it's not listed here: Try a site search. These are reserves or protected areas open to the public. Sicily also has several marine reserves, where scuba diving is sometimes permitted. Alcantara Gorge. The woods around the gorge are actually quite small, but this scenic site, on the Alcantara River off Route 185 (between Taormina and Mount Etna), offers a pleasant glimpse of Etna's geological influence on the surrounding countryside. The water that flows through this basalt formation is always cool, and bathing is permitted during the summer months. Cavagrande Cassibile Canyon. River gorge and series of steep canyons and a complex system of small waterfalls and natural pools. Near Avola Antica and Noto in southeastern Sicily. Etna. Sicily's largest nature reserve, surrounding the volcano. Favorita and Mount Pellegrino. Located on the edge of Palermo, formerly a royal hunting ground. Ficuzza. Large woods and wildlife sanctuary on the Bourbon Royal Estate near Corleone on the edge of the Sicanian Mountains. Fiumefreddo. Small nature reserve along the river of this name near Calatabiano, between Taormina and Catania. Madonie Mountains. Large reserve between the western Nebrodi region and Termini Imerese. Maccalube. A field of small gray mud geysers, unique in Italy. Outside Aragona, a few miles south of Agrigento. The reserve is administered from an office at Via S. La Rosa 53 in Aragona. Nebrodi Mountains. Vast forested reserve in northeastern Sicily. Sicanian Mountains. The region includes the Mount Cammarata reserve and Ficuzza. Ustica Marine Reserve. The largest underwater reserve in Sicilian territory. Vendicari Nature Reserve. In southeastern Sicily, this consists of marshhlands. Site of annual migration of hundreds of species of birds coming from northern and eastern Europe and Russia heading towards Africa. Zingaro Nature Reserve. Located near Scopello, a coastal village about 10 kilometers west of Castellamare del Golfo, this reserve is the home of flora and fauna typical of Sicily. For the most part, these are woods and bushlands. These are major ancient sites which are usually open to the public, though we cannot guarantee if or when each will be open. There are dozens of archeological sites in Sicily, and while some of the lesser-known ones may be more important historically they are typically less interesting for the non-specialist visitor who expects standing architecture such as temples or (at the very least) amphitheatres. The origin of the site (Greek, Roman, Sicanian, Punic, Sicel) is indicated. Akrai. Located near Palazzolo Acreide, about 40 kilometers from Siracusa, this city was founded by Greeks in 664 BC and has a small amphitheatre and the remains of a 6th century BC temple dedicated to Aphrodite, as well as a series of stone figures dedicated to the goddess Sibyl. Agyrium. At Agira between Enna and Catania. Birthplace of Diodorus Siculus. Agrigento. Valley of the Temples and small archeological museum. Catania. Several Roman-era theatres and walls are present in the city. Cefalù. 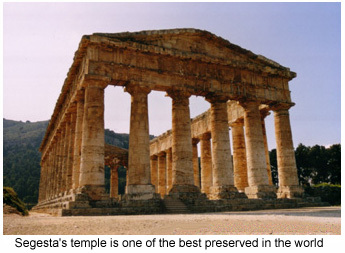 Oldest part of the Temple of Diana is Sicanian. Entella. Elymian settlement near present-day Contessa Entellina. Erice. 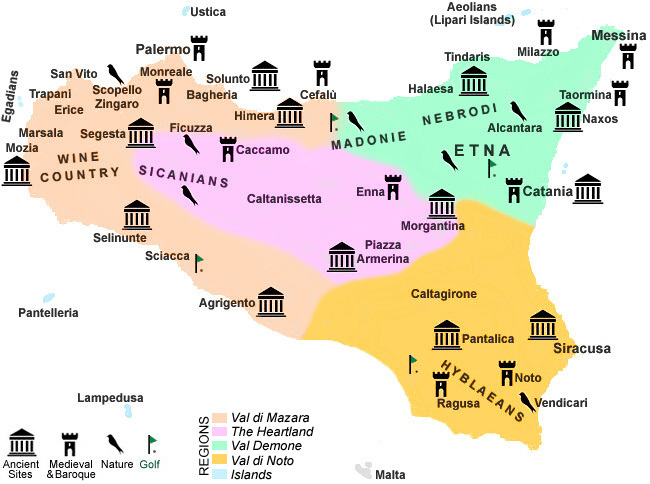 Phoenician and Carthaginian settlement had contact with Elymians of Segesta. Punic walls are still standing. Gela. Ancient Greek colony. Unfortunately, archeological site is next to oil refineries. Halaesa. Greek site near Tusa. Heraclea Minoa. Located at the mouth of the Halykos (Platani) river, where there is a small wildlife preserve. Himera. (Imera). Base of a Greek temple in archeological park. Ispica. Greek site is at Cava d'Ispica. Jato. The territory of the locality of San Cipirello (near san Giuseppe Jato) includes the Mount Jato site (and also an Antiquarium). Objects have been found dating from circa 800 BC, but the settlement was essentially Greek, with a temple built around 550 BC and an amphitheatre built somewhat later. Kale Acte. A Sicel town on Tyrrhenian coast identified with leader Ducetius. Precise location unknown but could be any of several sites. Kamikos. Sicanian settlement near Sant'Angelo Muxaro in region northwest of Agrigento. Marsala. Cape Boéo district has Roman ruins. Megara Hyblaea. On the Ionian coast south of Augusta. Founded around 750 BC, the town was destroyed in 483 BC, later refounded, but finally destroyed by the Romans in 214 BC. The site has yielded important finds. Morgantina. Recent excavations of a Roman settlement. Museum houses important finds. Motia. (Mozia.) A Phoenician harbor and settlement on an island off the coast of Marsala. Naxos. In Giardini along the coast near Taormina, this was the oldest permanent Greek colony in Sicily. Palermo. Piazza Vittoria. There are Punic (Phoenician and Carthaginian) sites in the city. Paliké (Palikoi). Sicel city near Mineo. Pantalica. Prehistoric necropolis in the Siracusa area. Piazza Armerina. Roman villa boasts most extensive Roman mosaic pavements anywhere. Segesta. Elymian and Greek site in western Sicily. World's best-preserved Greek temple and hilltop amphitheatre. Siracusa. 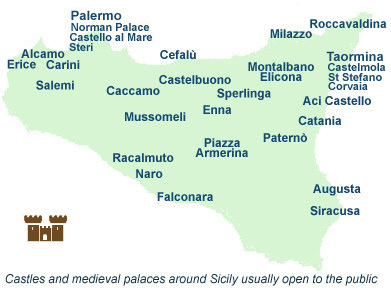 Sicily's principal Greek city was here. 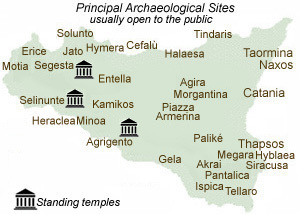 There's a large archeological park outside town, the Orsi Archeology Museum and (in Ortygia) temples and the mikveh. Solunto. Punic, Greek and Roman settlement near Palermo. Taormina. Greco-Roman amphitheatre and Roman architecture. Naxos is nearby. Tellaro. Roman villa near Noto and the Vendicari nature reserve in southeastern Sicily. Thapsos. Important Mycenaean site on the Ionian coast. Tindaris. (Tindari) Roman site overlooking the Tyrrhenian coast. These are essentially complete or nearly complete structures open to the public. Some are feudal mountaintop castles, others are seaside fortress protected by moats. Aci Castello. Coastal fortress near Catania. Norman-Angevin. Alcamo. Norman era castle in the center of this town between Palermo and Trapani; there are several other medieval structures in this locality. Caccamo. South of Termini Imerese. Carini. Though extensively restructured, the castle retains some medieval elements. Carini is a town outside Palermo near the airport. Castelbuono. Town in Madonie region, castle was seat of Ventimiglia family. Cefalà Diana. Small hilltop castle in the mountains south of Palermo near Mezzoiuso. Occasionally open to visitors. Enna. Castle and separate tower. Erice. This charming town has two castles, both well-preserved (though one is now a hotel). Falconara Sicula. Coastal fortress east of Licata, which also has a castle, and Gela. Licata. Seaside castle in the town of the same name, between Palma di Montechiaro and Gela. Montalbano Elicona. Located in a town in the Nebrodi Mountains. Milazzo. In the town of the same name. Mussomeli. Castle built by the Chiaramonte family on Saracen-era ruins. Naro. Small castle built by the Chiaramonte family on a Norman structure. Palermo. Royal (Norman) Palace, Steri, Castle-by-the-Sea. Palma di Montechiaro. Feudal fortress east of Agrigento near the southern coast. Paternò. Built of dark stone, this feudal castle in the province of Catania was erected during the eleventh and twelfth centuries in a unique style characterized by strong Saracen influences. Piazza Armerina. Castle is in the center of the town. Salemi. Swabian-era fortress in the locality of this name. Sperlinga. Fortress built into a rocky mountain overlooking the remote town of Sperlinga, near the woods of the same name in the province of Enna between Gangi and Nicosia. Taormina. There are two castles in the Castelmola district above Taormina; also Palazzo Corvaia and Palazzo Santo Stefano. Valdina. 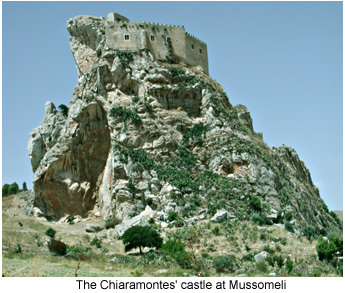 Located in the town of Roccavaldina in the Peloritan mountains near Messina, this castle, though extensively restructured, is one of the very oldest Norman fortresses in Sicily. These are non-fortified aristocratic residences built before 1500. Palermo. Zisa, Cuba, Palazzo Abatellis. Taormina. Palazzo Corvaia and Palazzo Santo Stefano. These structures retain their original architectural style. Agrigento. Cathedral (duomo), Church of San Nicola. Erice. Chiesa Madre (Mother Church). Messina. Saint Mary of the Germans (Gothic), Cathedral (restored to original style), Annunziata of the Catalans. Palermo. 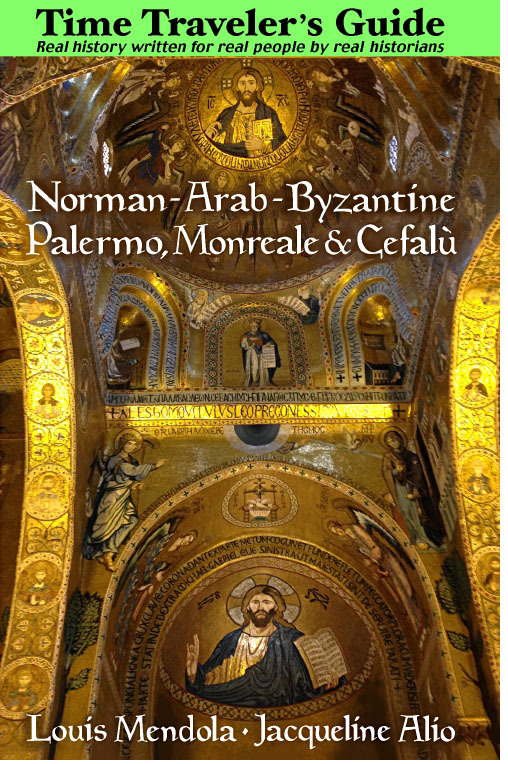 Cathedral, Saint Agostino, Saint John of the Hermits, Magione, Saint John of the Lepers, Saint Francis of Assisi, Palatine Chapel, San Cataldo, Martorana, Saint Mary of the Chain. Siracusa. Saint John's Abbey. Also Syracuse Cathedral. Palermo. Saint Joseph of the Theatines,Casa Professa,San Domenico. Siracusa. Syracuse Cathedral is a large Greek temple converted into Paleo-Christian church. There are numerous aristocratic homes in Sicily. We've listed those which are open to the public. Ficuzza. Royal hunting lodge in small locality near Corleone at northern edge of Sicanian Mountains. Palermo. Chinese Villa, Palazzo Mirto, Villa Trabia, Villa Malfitana.